OpenOffice Writer is a word processor and publishing tool. It supports different document formats, including .docx, and .doc. It's simple enough for a quick memo and yet powerful to create large documents, reports, and books. With rollApp you can try Open Office Writer online, so it is always with you on the move or at home. Create documents, align pictures or diagrams, save files with minimal fuss, the same way you use desktop software. Plus, you get cloud access: OpenOffice, Office and other documents and files are easily accessible from your cloud storage: Google Drive, Box and Dropbox. Writing documents online is easy: use OpenOffice Writer on rollApp from your desktop computer, laptop, iPad or Android tablet or other device. You can even get it for your Chromebook from Chrome Webstore. One click to launch. This is awful. Every time I try to open the app in the browser it asks me to sign in, once I do this, it just re-routes me to the page and says "You're already signed in." It never takes me to the actual Word Application. I end up having to open safari, go to the page itself and open it that way. Once I do this, it just sits on the "opening new window" screen forever and never opens. The only way to fix this is by shutting my entire iPad down and leaving it off for a little while. I love open office on my pc so i was excited to see an app. Unfortunately its not mobile friendly at all. Needs work. I used to love it until it froze on me twice and caused me to lose 3 pages of my english essay! It was very hard to use and also had a lot of glitches. I don't recommend this app to anyone who wants to print or save their documents . This program is everything that others charge for. I recommend this program whole heartedly. i cannot paste anything. what to do? Crummy, I am so angry. There is nothing of a scene from my book but some strange code that I can't change. I have no idea how to fomat it and get what I saved back. I would not give them a penny after this. Handled with care, this works well. Not for the impatient, though. I just lost a whole document because it did not let me save it. Needs integration with Google Drive and Google Cloud Print to be useful. Nice idea poorly executed. There is terrible lag working in the document. And if you try to use the on screen keyboard you can only see one line of text, maybe unless you at the bottom of the page then the keyboard hides everything. det är inte lätt att komma igång med den! estou achando super pratico. similar ao ms word. Now this is what i'm talking about, i like this app which allows me to do all my reports and save them in the cloud yay!! I have been using OO for a few years on my windows laptop. I like it. It's free. Got a chromebook so I tried this. It works but a bit laggy. The problem is that it doesn't show up on my drive and I can't print it. I can retrieve through the application but that's it. Maybe in the future. It really isn't as user friendly as google thinks it is. I hit something and accidentally increased the type to enormous and couldn't get it back to normal again. I had to the close the application and open another. And I can't figure out how to save anything. I need Times New Roman font for school. Can you do that? Otherwise perfect! I'm using it right now for an essay notin happened ! This was great at first had a few problems but wasn't that big of a deal. I typed up an essay on here and haven't been able to save it or even reload the essay. Wrote the essay at around 2:40ish it is now almost 9:00 pm and still can't get my essay back. Like others before me I have given this a poor rating solely based on the fact that, as a writer, a use a keyboard with my Ipad and this application will not allow me. Great app but rendered usless for what I want to use it for. When we are able to use a keyboard I will start using the product and definitely change my rating. ... useless for languages with many words beginning with a capital letter. If you turn on captial letter with the shift-key, every following letter is capitalized, so you have to turn off the function afterwards with a second keystroke - contra-intuitive behavior of the program and against the convention of all programs I used the last 25 years! 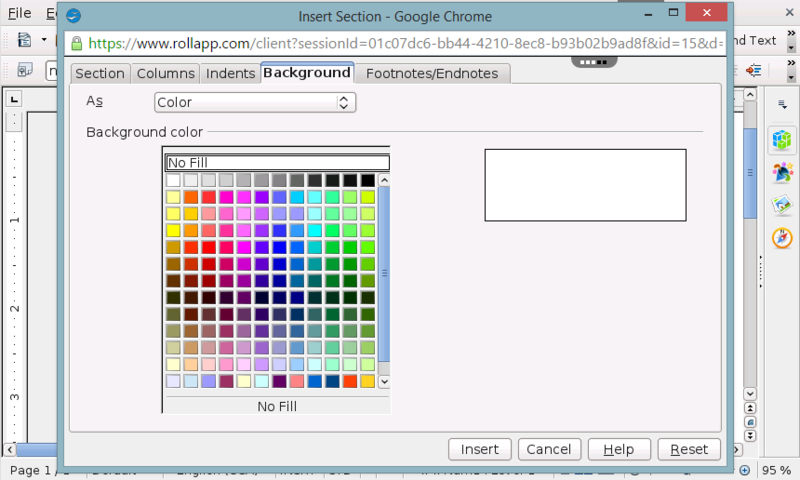 Not being able to cut & paste between rollapp and other application is a drawback. I used this app to my great satisfaction. This is great product. So I have a plan to continue to exchange with those people who have not been told of, or maybe refuses to try this software product. I've never had problems people wrote here. PLUS, the price is right! Para cuando en idioma castellano o español? Nos hace falta. Gracias! Great app for me get my writing assignments done for my classes in school on my Chromebook. I really love this service can e a little laggy at time but far better features than Word Web App. Running XP Pro. Unable to get printer set up on my desktop. The help feature is a waste. No way under printer settings to direct to my printer. I use this several weeks and it works ok. have you add cloud storage for saving your files? moreover, if internet connection is lost you can reconnect during 10 minutes and it will work from the place you leave it. it is possible to get blue tooth key boards to work with it office writer. If you look at the bottom of the screen there is an menu arrow that you have to swipe up. It shows a keyboard icon that you have to select . Once you select it you can use your bluetooth keyboard. Cannot type in Chinese character. Please kindly update. Thx. Unable to use. While the idea is great, I'm unable to use my Bluetooth keyboard for my writing. Keyboard works fine with Note and my browser for other things, but won't work in the OO Writer shortcut. I was all set to write my meeting notes, but quickly realized I would have to use the touchscreen keyboard. No thanks. If there is a way to get bluetooth keyboards to work in the shortcut, I'll gladly update my rating. Formatting is great - by that I mean that what's on screen is exactly as on the computer screen. That's good. Problem: it's not easy to navigate the text, to go up and down for example, or to input text. I could use it to write a quick letter or short doc, not a whole long document. Please find a way to enable copy and paste from other apps, for example text only apps, which are easier to write in. Then one could write text files, copy and paste into Open office writer and be done with it. A tablet useability - no mouse, no keyboard, finger gestures only - comes with a number of limitations, which even great applications like OpenOffice cannot overcome. 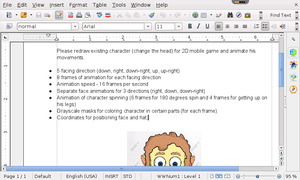 One must then trim down features from OpenOffice within the true interactive capabilities of a tablet. My humble advice would to draw the distinction between what is available via a full-blown Personal Computer versus a tablet. In any case, a 5-star for this 1st successful iteration of rollApp outshining by far SkyDrive rival. Hey I was contacted very quickly by the developer after leaving the last review. 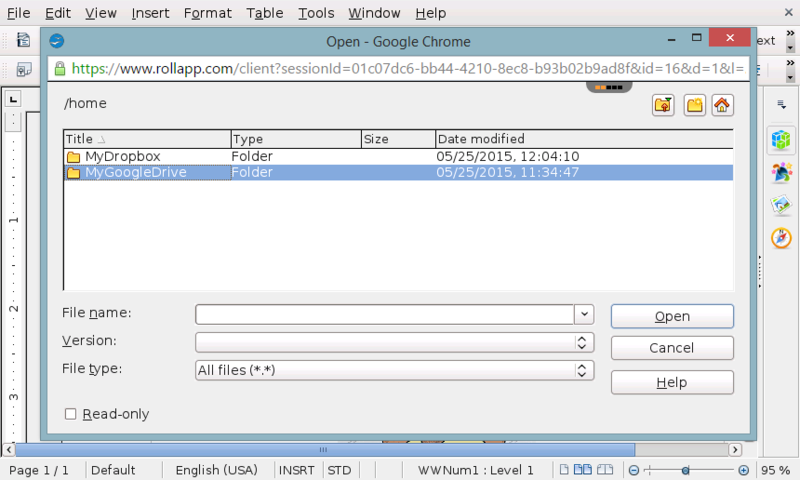 To be very clear rollAPP works well on iMAC - however so does standard Open Office. On Ipad rollAPP is ok but there are basic features still to add as you cannot, for example, copy and paste into it from the web. As the developer bothers to read these and has been proactive in understanding the issue I have increased the 2 stars to 3 - pending clipboard type functionality being extended to the iPad version. The app is so slow that makes it quite impossible to edit the text. Otherwise, this makes a great option for word processing via iPad. Anyone know how to connect a new printer in Writer, to enable me to print a letter? Where is link to download this ? Everything works great! If you are looking for a good option for printing, Readdle Docs has this capability. Use them both to print the documents you create here. Great app - so pleased somebody's finally produced this. The one thing that I think might really help users is a format guide, explaining what formats (.doc, .docx, .rtf etc) open in different programmes. It's taken me quite a bit of trial and error to work out that it is only .rtf that opens in Open Office, Dropbox, and Microsoft Word 2003. Apologies in advance if this is already somewhere on the website and I've failed to find it - if you let me know I'll update your score to 5 stars! I really like being able to use Open Office on my iPad. Thanks for the hard work to make it so. That said, It would be great if there were an option to save the document directly to the bookshelf, instead of having to use the email/icloud storage work around. It would be even better if it could access airprint as a printer to print locally. Thank you. Dialogue boxes slow to upload on IPad. 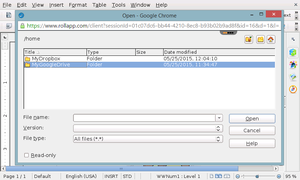 Difficult to open files and export docs to PDF. It's a new learning curve, but having the *full functionality* of the OpenOffice suite available on the iPad is pretty darned slick. Great job. Same problem as Mahdis, but also having problems retrieving docs from my Google account. Is not recognizing Word or Notes docs. Can not save, even though cloud storage is connected. 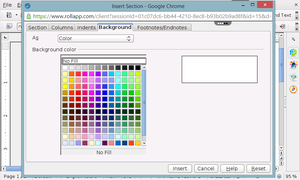 OpenOffice.org Writer.